Old Trafford, Manchester - Manchester United Blog: Norwich v United: Giggs and Welbeck were key last time out. 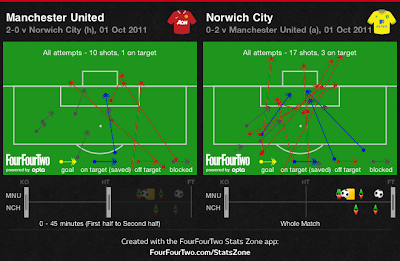 Norwich v United: Giggs and Welbeck were key last time out. On Sunday United travel to Carrow road to face Norwich; the first of two back to back away games. When the sides met at Old Trafford back in October United had just beaten Spurs, Arsenal and Chelsea in their previous three home matches by a combined score of 14-3. There seemed to be little hope for Norwich. But the canaries made it difficult for United that autumn Saturday afternoon. It wasn't until Giggs and Welbeck were introduced after the hour mark that United were able to break the visitor's resistance; and but for some wayward finishing Norwich could easily have caused an upset. 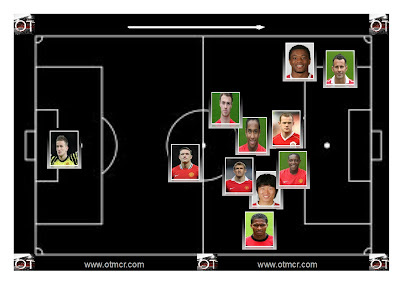 Blackboard 1 (click to enlarge) shows the average position of United players on the ball in the first half. 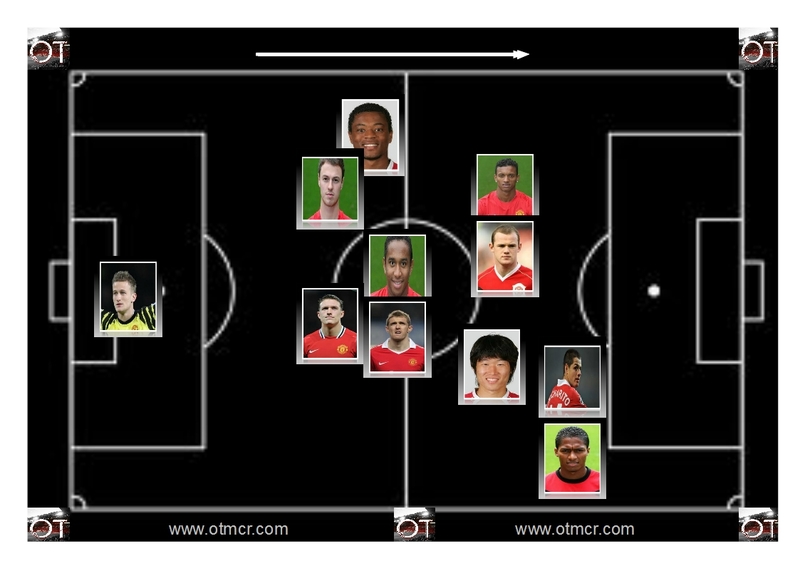 As you would expect, all United players were in advanced positions with Evans, unusually, the furthest back. In the absence of Rio Ferdinand it was the Northern Irishman who had to play the more 'mature' role while Jones was more adventurous. Evra and Valencia, the full backs, were constantly on the attack too. In midfield, Fletcher and Anderson both sat back with six players ahead of them. Nani drifted inside, as he does. Park was tucked in too, with only the full backs providing real width. Up front, Hernandez was unusually deep, crowding Rooney's natural areas. With this formation it is no surprise that United were struggling to score. Although they managed 10 shots in the first half, 5 of these were long range efforts from outside the box; four more were blocked by defenders in a crowded penalty area and in the whole 45 mins the Norwich keeper only had to make one save. Blackboard two shows the average touches of each player between 45mins and 60 mins. The first obvious change is that Nani and Park have swapped wings, with Park sitting deep, almost making a 3 in midfield, to allow Valencia to get forward more. Rooney and Hernandez have separated too. 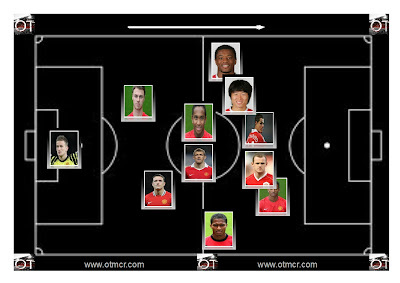 The two central midfielders are unchanged while at the back Evans has advanced slightly in Evra's direction. The changes did not yield a goal however. It was a woeful 15 minutes with only two long range efforts off target from the reds. Predictably, Ferguson was forced to make changes. Blackboard 3 shows the period between 60 and 70 minutes during which the changes were made and the opening goal was scored by Anderson. Giggs replaced Nani on 64 mins. Welbeck replaced Hernandez a minute later and United took the lead on 68 minutes. We can see that in this ten minute period, in which the game was effectively won, United were camped in the Norwich half. Welbeck, having replaced Hernandez, was able to keep an advanced and central position. Valencia kept width on the right; Evra and Giggs did likewise on the left. Fletcher and Anderson came forward; Anderson more so, resulting in his goal. By this stage, Evans had replaced Jones as the the more adventurous of the centre backs. There are almost no ball touches in the United half during this ten minute period. It is no surprise that the reds broke the deadlock with this formation. The strikers are well positioned in threatening areas and would have been well supplied by Valencia, Giggs and Evra who all managed to get into dangerous wide positions. United managed three shots in the ten period, all of which came in the five minutes after the substitutions. With attacking back up in the form of Park, Fletcher and Anderson, United moved in for the kill and struck the decisive blow. Blackboard 4 shows how United retreated to protect their lead in the last twenty minutes. The reds dropped back significantly having taken the lead. Anderson, the goalscorer, was replaced by Ferdinand on 77 mins. 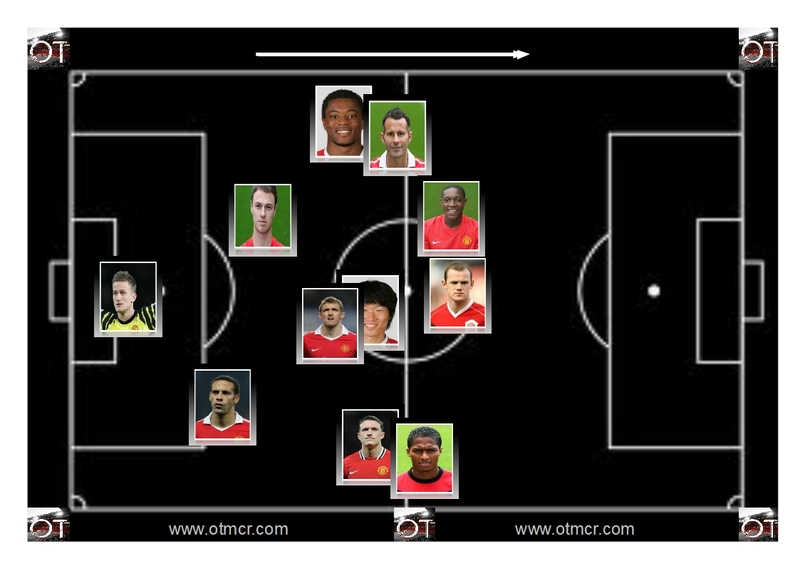 Jones moved to right back; Valencia went to the right wing and Park slotted in beside Fletcher in the midfield. It was a dramatic change. 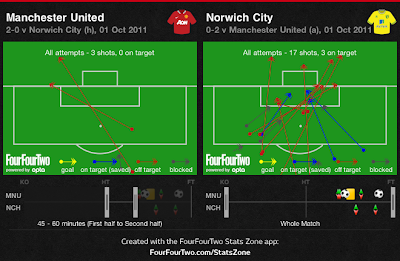 From having 9 players pushing into the opposition half, United now had only three regularly going forward. Overall, it was a very disciplined twenty minutes. The team's shape is almost impeccable and it is no surprise that they kept Norwich out while adding a second goal through Welbeck on 87 mins. 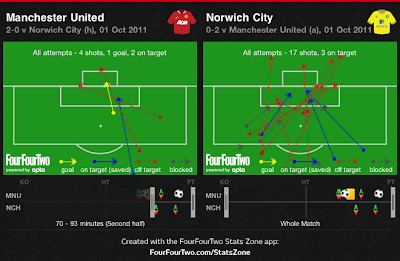 With Norwich seeking an equaliser United were able to sit back and pick them off. Fergie's men managed two shots on target, two off target and scored one goal in the last twenty. From a United perspective it was a poor match last October. Perhaps we had been spoilt by the reds scintillating start to the season and expected them to knock 5 or 6 past the newly promoted canaries. As it transpired, Norwich were worthy opponents on the day. United are unlikely to be complacent at Carrow Road. In terms of the United line-up, it will be interesting to see whether Ferguson includes Giggs and Welbeck given the effect their introductions had in the match at Old Trafford. Giggs, still awaiting his 900th appearance, has not featured for United since February 11th, while Welbeck was restricted to fleeting cameos against Ajax. Both players should be well rested and fresh for the trip to East Anglia.